Did you hear? There was a massive earthquake in California today. Los Angeles? The San Andreas Fault? No. A brand new fault. Thank you. Thank you. I’ll be here all week. Don’t forget to tip your servers, and try the veal. Of course, that joke easily translated to the Bushes later. Today, the torch was definitely passed on to Donald Trump. 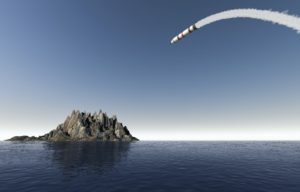 BALLISTIC MISSILE THREAT INBOUND TO HAWAII. SEEK IMMEDIATE SHELTER. THIS IS NOT A DRILL. There was never a real threat. There was no international crisis precipitating the alert. NORAD was not fooled by a flock of geese. It was a stupid mistake. 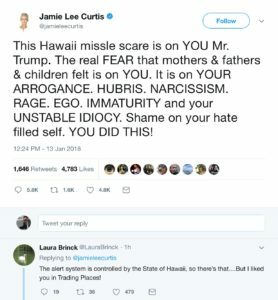 Actress Jamie Lee Curtis tweeted that “[t]his Hawaii missile scare is on YOU Mr. Trump.” How? Among other things, it appears that the President’s “arrogance,” “ego” and “immaturity” corrupted some low-level bureaucrat’s skill-set in the mind of the actress best known for battling serial killer Michael Myers on various Halloweens. She seemed to think President Trump’s “unstable idiocy” manifested itself thousands of miles from Mar-a-Lago, forcing some functionary to send out the errant alert. While such extreme and ignorant pablum is expected from the Hollywood elite, it’s a shame that the same sort of vitriol came from an American politician as well. And, in this case, it came with a demand to change policy – likely for the worse. Representative Tulsi Gabbard is a member of Hawaii’s solidly left-wing congressional delegation. Pretty much all of Hawaii’s government, it should be noted, is a deep-blue stronghold. 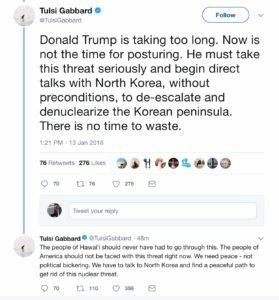 According to Gabbard, we need “direct talks… without preconditions… to de-escalate and denuclearize the Korean peninsula.” No preconditions? How does entering into negotiations with a saber-rattling madman with no preconditions get to the goal of denuclearization? Saber-rattling is the North Korean way of diplomacy! But Trump’s tweets prodding Kim – the ones that obviously fueled the vitriol of Curtis and Gabbard – appear to have worked. Since when have North and South Korea entered into direct talks? Since Trump’s tweets, after years of silence. And Trump is open to talking with the North Koreans – without preconditions. The unwarranted fear foist upon people in Hawaii was regrettable, but it’s not a regret Trump must bear. If anything, his work may be diminishing that overall threat. Not that the left – by way of Washington and Hollywood – is willing to admit.